A clogged garbage disposal can be incredibly frustrating. We never really notice how often we use our kitchen sinks until they’re clogged and not working. The good news is a garbage disposal can be unclogged with a few DIY tricks. If you’ve already tried flushing down the obstruction with water with no luck, it’s time to get your hands dirty. So, How to Unclog a Garbage Disposal, you ask? Look no further. A word on safety: Water and electricity make for a dangerous combination. Before attempting to unclog a garbage disposal, cut off its power with a switch found on the wall or under a cabinet. If for any reason you can’t find the power switch, shut off the home’s main breaker until you’re finished. Always wear thick gloves to protect your hands from the sharp garbage disposal blades. For simple garbage disposal clogs: Troubleshooting garbage disposal issues means getting down and dirty. Take flashlight and shine it down your clogged sink drain. If you can see what’s clogging the disposal, take a pair of pliers and carefully pull the obstruction out. Wait a few minutes for the engine to cool and turn on the disposal to see if that was the problem. If not, keep reading. It may sound strange, but the clog is likely in a pipe on the side of your sink that does not have the garbage disposal. 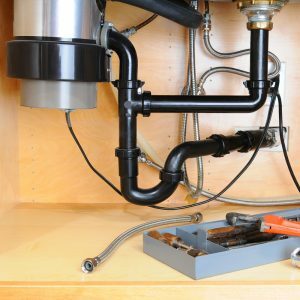 A quick peek under your sink will reveal both straight and bent pipes. The pipe that is bent like an elbow macaroni is more likely to have the clog. Step 1: To unclog a pipe with baking soda, pour half the box of baking soda into the drain on the side of the sink where the disposal is located. Pour the other half of the box into the other side of the sink. Next, pour white vinegar into both sides of the sink, distributing most on the side without the garbage disposal. Allow the baking soda and white vinegar to sit in the sink for about 30 minutes. Then, pour hot water into both openings. This should clear the clogged pipes. Step 2: If you find that your sink is still operating at less than 100%, you can also disassemble the sink pipes yourself. This requires a bit of plumbing know-how, so if you’re uncomfortable doing this yourself, Call Us at Simpson Plumbing for a professional Vancouver plumber to help you out. For this approach, grab the rags and bucket to collect any refuse that falls out of the pipes when opened up. Tap the pipes lightly and listen for an echo (hollow) vs. a dull (solid) sound, indicating the clogged area. Open up the pipe as close as you can to the clog and empty any material within. Close pipes back up and run your water to see if the clog has cleared. Allow hot water to run through the garbage disposal to remove excess gunk. Step 3: You’ve done your best, but the obstruction remains: It’s time to call in the pros. A professional plumber can have your pipes cleared and unclog your disposal quickly, and can answer any questions you have about your particular pipes and tips to avoid garbage disposal clogs in the future. A clogged garbage disposal can be frustrating and a little gross. Bypass the frustration of a clogged kitchen sink with a few easy DIY tricks, or skip the headache and call Simpson Plumbing Today at 360-818-7819.